There’s a cold front in our city! Soft-serve ice creameries have been popping up like daisies across town over the past few months. Lisa Cam and Vivien Yu scoop out their sweet favourites, just for you..
Perched in a corner on Fashion Walk’s first floor, this Japanese dessert shop has quickly become known for its supreme quality. Using the coveted Sawatari tea, the green tea soft-serve here is fragrant with mocha. 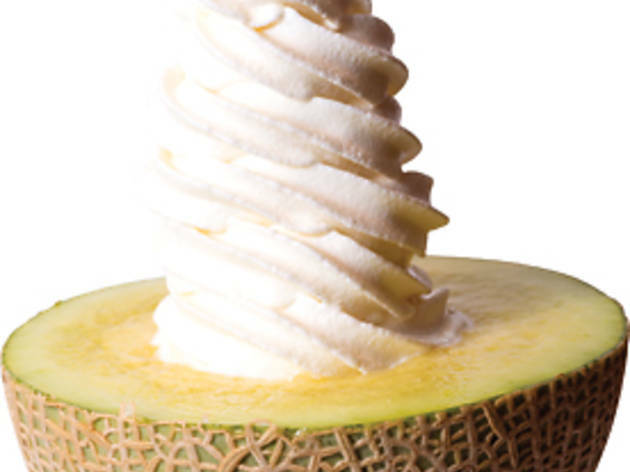 Try it in the parfait ($49) or a half of a delightful muskmelon ($180) – man, it’s worth the calories. Shop F9, 1/F, Fashion Walk, 11-19 Great George St, Causeway Bay, 2897 1118; fb.com/icremeria. When this Korean brand landed in Hong Kong itimmediately had fans across the city due to the milk used in the soft-serve. It’s a Korean product that ensures both a healthy taste and a distinctly aromatic creamy flavour in the ice cream. 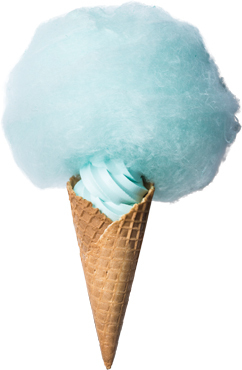 Honey Creme has also quickly become famous for its innovative combinations, like the massive popcorn cone ($38) and the candy floss that’s made from organic sugar ($38). Try the Valentine’s macaron specials ($52) that are available until March 31. Sweet. 34 Lee Garden Rd, Causeway Bay, 3525 1264; honeycreme-icecream.com. 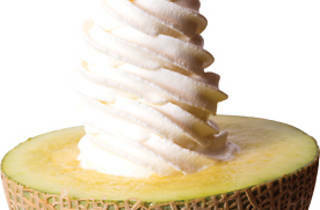 Fancy accompaniments aside, what makes Soft Creme special is its range of flavours. You can choose between Hokkaido 3.6 percent fat milk and cereal milk in your soft-serve and then you can choose varieties like cereal, fruits or popcorn – but what gets us really going is the monthly alcohol flavours like champagne or sangria. The recent Brut Rosé Champagne variety was launched to celebrate Valentine’s Day and it’s fab. Keep tabs on the website to see which tipple is next. 7 Shepherd St, Tai Hang, 2370 3205; fb.com/softcreme. Ball Ba Balloons is a joyful place. Located in Causeway Bay, it looks like just a colourful balloon shop – but it’s actually much more. It’s home to Lol Ice Cream Shop as well. And this place is anything but full of air. Specialising in Hokkaido milk ice cream, the soft-serve here is delicious. 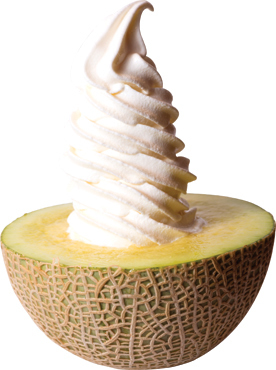 One of the most popular varieties is the salted Hokkaido milk soft-serve ($29). If you never thought salty ice cream would work, you were wrong. 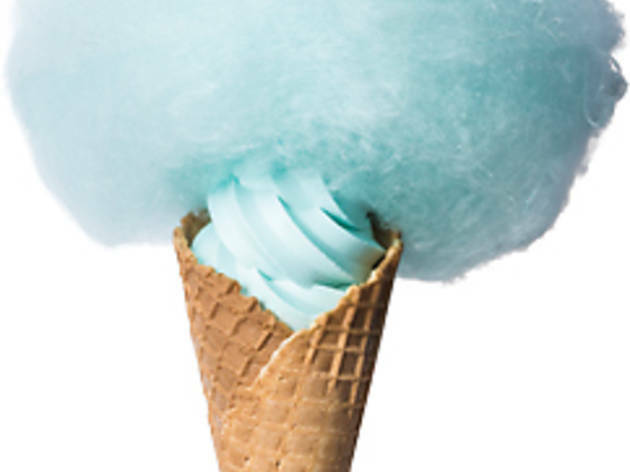 In its signature blue colour and when drizzled with caramel, this baby makes for a unique treat. Shop 20-21, G/F, Leishun Court, 106-126 Leighton Rd, Causeway Bay, 2386 3361; ballba.com.hk. Mong Kok’s Kwong Wah Street has become a dessert hotspot of late and, opening in July last year, Honey Sparkling took it one step further. This is a local establishment that has taken soft-serve to the Mong Kok masses. We’re championing the signature dessert, the ‘honey bee’ ($45), that uses honeycombs fresh from an apiary in Yuen Long. Try the array of parfaits here – which only use 3.6 percent Hokkaido milk – or go for the huge ice creams to share. Shop 8, 2 Kwong Wah St, Mong Kok, 3489 2928;facebook.com/honeysparkling. Did we say Honey Sparkling is taking soft-serve to the masses in Kwong Wah Street? Sorry, we mean Cafe Aboong, which has just opened up, is also doing the same. After trying the waffle fish in Korea, the owners say they knew it would be a hit back here in Hong Kong. So they brought it over. The waffle fish is basically just that – a big fish-shaped cone that’s embedded with either custard or red bean and is filled with soft-serve, freshly-made yoghurt and fruit ($35). Don’t be surprised if you have to wait 10 to 15 minutes for your fish, though, as people cod not get enough of this place. Shop G18, G/F, Yan On Bldg, 1 Kwong Wah St, Mong Kok, 6194 9796; fb.com/cafeaboonghk. Hidden in the sidestreets of Hung Hom, Eyescream and Churros is one of the first venues in the city to offer the heavenly combination of frozen soft-serve ice cream with freshly made churros. Founder Muse Leung, who’s also a cooking teacher in Sai Kung, decided to bring the idea over after trying it in Korea. The churros here are fried with vegetable oil so they’re not greasy. Besides the signature combo ($38), foodies should also try the Eyescream shaved ice ($42), which comes in seven flavours. Shop B1, G/F, Tak Man Bldg, 29 Tak Man St, Hung Hom; fb.com/eyescreamandchurros. Oh Cow! 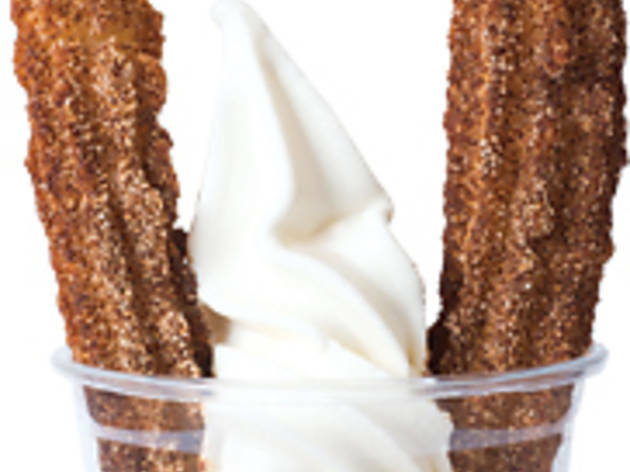 has transformed the ordinary soft-serve into a visual masterpiece. The signature cones ($42) are based on the ‘elements’ of nature – earth, water, fire and air – and the designs and flavours of each cone are unique to their own ‘element’. One of the most popular is the ‘fire’ cone. It’s made up of a rich chocolate softee that uses 72 percent cocoa and is topped with candy floss and liquid nitrogen-frozen strawberries. Everything is made fresh in store. 32 Mody Rd, Tsim Sha Tsui, 2886 0448; fb.com/ohcow.softcream. 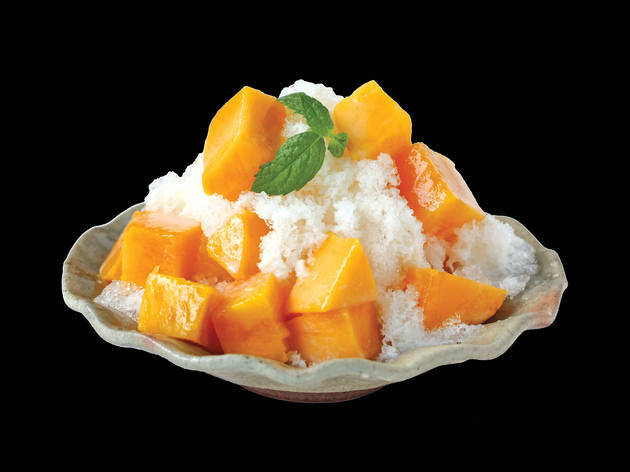 Summer is merciless in Hong Kong but the city’s best kakigori shops are here to help.